Regardless of who wins the primary, the party hopes to break the fever of the past 7 1/2 years. It’s been a long seven and a half years for Maine Democrats. After their nominee, state Sen. Libby Mitchell, finished third in the 2010 governor’s race, the party regrouped and returned in 2014 with a proven winner, U.S. Rep. Mike Michaud, plus an arsenal of reasons why Republican Gov. Paul LePage didn’t deserve a second term. He got it anyway. Four years later, Democrats are once again hoping to hit reset as they prepare to decide which of seven primary candidates is best equipped to convince Mainers that the state needs a dramatically different – and, they insist, more civil – approach to government post-LePage. “The calculus is who can win this race and what should the Democratic Party stand for in light of these eight years,” said Trish Riley, chairwoman of the Brunswick Democratic Committee and a veteran party activist. Seven contenders will vie for the Democratic nomination on June 12: Attorney General Janet Mills of Farmington, former House Speaker Mark Eves of North Berwick, veteran and attorney Adam Cote of Sanford, state senator and former Cumberland County Sheriff Mark Dion of Portland, lobbyist and advocate Betsy Sweet of Hallowell, former state Rep. Diane Russell of Portland, and former Biddeford Mayor Donna Dion of Biddeford. Ever since joining the race last July, Mills has been widely viewed as the front-runner because of her name recognition and high-profile office. Her opponents’ eagerness to “pile on” against her in speeches and forums – as well as recent signals of anti-Mills collaboration between other campaigns – has merely underscored that perception. Yet Maine’s experiment with ranked-choice voting adds a larger-than-normal dose of uncertainty as to who will be the standard-bearer in the party’s efforts to regain the Blaine House after two stinging defeats. “Anybody who predicts how ranked-choice voting is going to shake out in a seven-person field, or even a four-person field, is speculating because, really, we don’t know what the impact will be,” said David Farmer, a veteran Democratic campaign consultant who is not currently involved in any gubernatorial campaign. The field is a politically diverse crew, including four women hoping to be the first of their gender to serve as governor. Mills is generally perceived to be a moderate. She is also the only candidate from the more conservative 2nd Congressional District – a fact she points to frequently. Cote is Mills’ biggest rival, in the eyes of many observers and party insiders. A 20-year Maine Army National Guard veteran, attorney and renewable energy business owner, Cote is also regarded as a more moderate Democrat. But he’s sought to distinguish himself from Mills on issues such as guns and the environment. Eves, Russell and Sweet portray themselves as unabashedly progressive. Russell touts her leadership in the marijuana legalization and ranked-choice voting ballot campaigns, while Sweet has a 35-year track record of advocating in Augusta on behalf of the elderly, women, the environment and LGBTQ causes. Eves, a professional counselor, often quips that Maine “is ready for a family therapist to heal the damage Paul LePage has done.” He also argues Democrats lost the past two elections because voters didn’t see enough daylight between the party nominees and independents. Mark Dion and Donna Dion, who are unrelated, aren’t as easy to label as moderate or progressive. A former Biddeford mayor, Donna Dion pledges to bring civility and financial know-how to the governor’s office. Mark Dion, on the other hand, says his four decades of experience as a Portland police officer and Cumberland County sheriff, as well as his work as an attorney and lawmaker, give him the ability to work on difficult challenges with all stakeholders. Bartlett’s comments about “tremendous enthusiasm” and a “fired up” base don’t appear to be election-year political rhetoric. 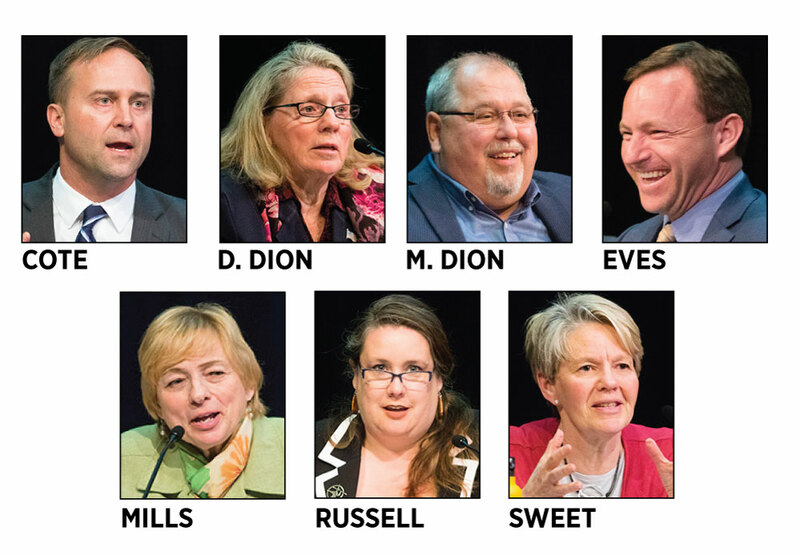 More than 400 people attended a May 9 forum with all seven candidates held at Brunswick High School just a few weeks after a Bath forum drew 300-plus attendees. On May 12, audience members filled the gymnasium of Great Salt Bay Community School in Damariscotta for a forum. And campaigns report that house parties – intimate affairs that have become a staple of statewide politicking in Maine – are drawing dozens and dozens of people. Nationwide, Democratic strategists are playing up the idea of a “blue wave” – a veritable political tidal wave large enough to sweep the party back into power in Congress and in statehouses across the country after years of losses. Although there were 52,231 more registered Democrats than Republicans in Maine as of March, both parties are outnumbered by unenrolled voters. Their ranks have grown at six times the rate of the two major parties combined, and they now account for 36.5 percent of all voter registrations in Maine, 1 percent higher than in 2010. That trend and the likely presence of at least two independents on the November ballot – Maine State Treasurer Terry Hayes and consultant Alan Caron – must factor into the Democratic nomination process, Riley said. As with any perceived front-runner, Mills is having to deal with an increasing number of jabs and attacks from other Democratic contenders, particularly Eves and Cote. Her tenure as attorney general has given her a unique position – and arguably a pulpit – to take high-profile stands against LePage’s conservative policies. Other candidates have pointed to Mills’ old A+ rating from the National Rifle Association at a time when many on the left regard the NRA as the major obstacle to gun control measures. Mills responds that those ratings were for her votes as a legislator well over a decade ago, and that she now supports some gun control proposals. Mills’ primary opponents have also highlighted her office’s strained relationship with Maine’s Indian tribes. Mills has defended the state against lawsuits filed by the Penobscot and Passamaquoddy tribes, and challenged federal decisions to require tighter water-quality standards in the Penobscot River and other waters used by for sustenance fishing. All of this has led to speculation that some of the other top challengers are coordinating their efforts to undercut Mills, with an eye toward potentially winning during subsequent ranked-choice voting tabulations. Cote spokeswoman Monica Castellanos flatly denies that. Amount of money in the bank is not always a good indicator of success – for instance, LePage won the 2010 Republican primary while spending a fraction of some of his competitors. But fundraising ability can indicate a candidate’s breadth of support among party donors. Cote had raised the most money as of April 24, the last filing deadline, with $804,477. But Mills had raised $571,522 while Eves had raised $305,356. Sweet, who is the only Democrat utilizing Maine’s public campaign financing system, had qualified for $797,000 in Clean Elections funding plus seed contributions as of last week. And Farmer says Sweet’s access to that much money without having to court so many donors could be the untold story of the Democratic primary race so far. The other candidates had raised less that $70,000 each as of April 24. Under the ranked-choice system, Democrats will be able to vote for their top choice on the ballot but also list their alternative choices in order of preference all the way down through the field, if they desire. The tabulation process will then winnow the field until one of the seven attains a majority of the vote. Some candidates are actively campaigning to be second choice if a voter has already picked a preferred nominee. Others seem to be propping up each other. Likewise, Sweet has said that Eves would be her second choice on the ballot. Mills is sticking to her core argument that she has the best qualifications, temperament and track record of success in the 2nd District to win statewide in November. Bartlett, the party chairman, is among the multiple observers who feel the ranked-choice voting system has led to a more civil dialogue among candidates and more attentive potential voters.